See LINKS below for each part. 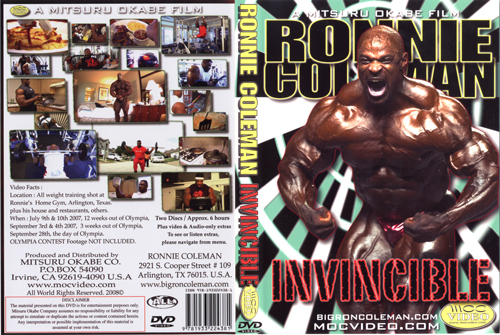 See 8 time Mr Olympia winner Ronnie Coleman’s prep for the 2007 Mr. Olympia – why he was said to be truly ‘Invincible’. This is the ultimate video for all Ronnie Coleman fans. - Ronnie interview while driving. Speaks on how he got into bodybuilding and never wanted to be a bodybuilder in the first place. The first part of this DVD was shot on July 9th and 10th 2007 on Ronnie’s final off-season week. This was 12 weeks out from the 2007 Olympia. Then more taping again on September 3rd and 4th, 2007 - just 3 weeks out from last year’s Olympia. at Big Ron's home gym in Texas. Olympia Contest footage not included. To see Ronnie in the 2007 Mr. Olympia, please click here for A-1242DVD.